Solar Power From Space: A Better Strategy for America and the World? This giant disk floating in space isn't a UFO. It's a power generator, harvesting energy from the Sun for a variety of uses back on Earth. Such space-based solar power generators have many applications, not just on Earth, but also in space. unlike oil, does not generate profits used to support Al Qaeda and dictatorial regimes. unlike nuclear, does not provide cover for rogue nations to hide development of nuclear weapons. unlike terrestrial solar and wind, is available 24/7 in huge quantities. unlike oil, gas, ethanol and coal, does not emit greenhouse gasses, warming our planet and causing severe problems. unlike nuclear, does not provide tremendous opportunities for terrorists. unlike coal and nuclear, does not require ripping up the Earth. unlike oil, does not lead us to send hundreds of thousands of our finest men and women to war and spend hundreds of billions of dollars a year on a military presence in the Persian Gulf. 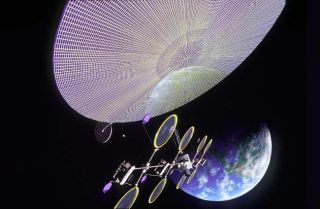 The basicidea: build hugesatellites in Earth orbit to gather sunlight, convert it to electricity,and beamthe energy to Earth using microwaves. We know we can do it, most satellitesare powered by solar energy today and microwave beaming of energy has beendemonstrated with very high efficiency. We're talking about SSP - solarsatellite power. SSP is environmentallyfriendly in the extreme. The microwave beams will heat the atmosphere slightlyand the frequency must be chosen to avoid cooking birds, but SSP has noemissions of any kind, and that's not all. Even terrestrial solar and windrequire mining all their materials on Earth, not so SSP. The satellites can bebuilt from lunar materials so only the materials for the receiving antennas(rectennas) need be mined on Earth. SSP is probably the most environmentallybenign possible large-scale energy source for Earth, there is far more thanenough for everyone, and the sun's energy will last for billions of years. While help is always nice,the U.S. can build and operate SSP alone, and SSP is nearly useless toterrorists. The satellites themselves are too far away to attack, the rectennasare simple, solid metal structures, and there is no radioactive or explosivefuel of any kind. Access to SSP energy cannot be cut by foreign governments, soAmerica will have no need to maintain an expensive military presence inoil-rich regions. The catch is cost. Comparedto ground based energy, SSP requires enormous up-front expense, although afterdevelopment of a largely-automated system to build solar power satellites fromlunar materials SSP should be quite inexpensive. To get there, however, willcost hundreds of billions of dollars in R&D and infrastructure development- just what America is good at. And you know something, we're spending thatkind of money, not to mention blood, on America's Persian Gulf militarypresence today, and gas went over $3/gallon anyway. In addition, we may end upspending even more to deal with global warming, at least in the worst-casescenarios. Expensive as it is, SSP may be the best bargain we've ever had. What should we do? Besideshaving NASA do interesting and inspiring things, direct and fund NASA to dosomething vital: end U.S. dependence on foreign oil by developing SSP. Redirectthe lunar base to do the mining, and develop the launch vehicles, inter-orbittransfer, and space manufacturing capacity to end oil's energy dominancecompletely and forever. It will be expensive, but it's a better, cheaper, saferstrategy than military control of oil in far flung lands. Oh, by the way, SSP willdevelop lunar mining, launch vehicles, and large satellite construction - mostof what we need to buildspace settlements! Al Globus serves on theNational Space Society Board of Directors and is a senior research associatefor Human Factors Research and Technology at San Jose State University at NASAAmes Research Center. Orbital Outposts: ABetter Bet than a Moonbase? NOTE: The views of thisarticle are the author's and do not reflect the policies of the National SpaceSociety. Visit SPACE.com/Ad Astra Online for morenews, views and scientific inquiry from the National Space Society.